manual welding booths, eliminating the need for costly new robotic cells. 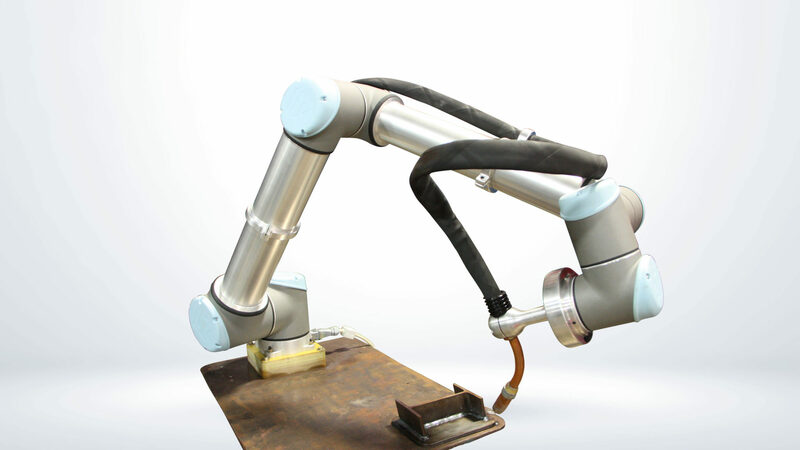 The welding system integrated with the UR robot is comprised of a Profax wire feeder and water cooled torch enabling welds up to 600 amps, with torch bracket, all cables and hose packages included. The simplified programming is enabled by direct software integration into Universal Robots’ own programming environment through the Universal Robots+ platform that will allow users to program advanced settings directly on the teach pendant that comes with the UR robot. Advanced Mode Functions with fly-in gas pre-flow time, strike volts command, welding wire feed speed command, start motion delay, crater fill time, wire burn back time, gas post-flow time. Alarms for welding arc failure detect, stuck wire detect, erratic wire feed detect.